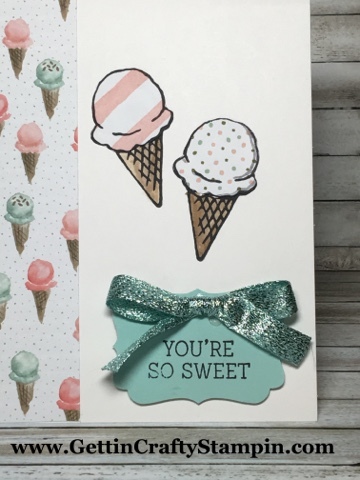 Create a sweet ice-cream card that will add calorie-free smiles to someone's day. 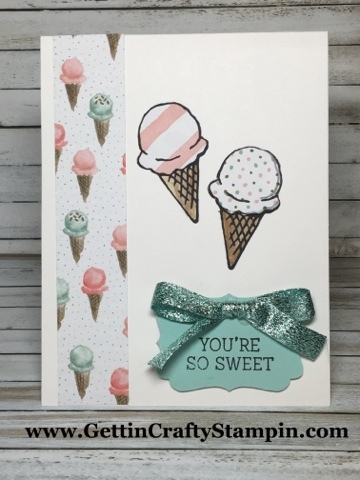 This fun and sweet sparkling hand-stamped card was created with this awesome FREE for ONLY 6 MORE DAYS Sale~A~Bration stamp set at our recent Sparkling Spring card making class. Inspired by my dear friend Selene's recent card class. Join Us and connect while card making and creating memories. I grew up with the most amazing grandparents. They were really some of my closest friends. They instilled in our family a love of God, family and ice cream! Thrifty's ice cream was our weekly trip. This sweet card is in honor of them. Create this sweet card that is calorie-free with this FREE Sale~A~Bration stamp set, Honeycomb Happiness (I adore this set!!). ~ Stamp this card on the Thick Whisper White card stock with the Black Archival ink pad. ~ Fussy Cut with your Paper Snips them out. ~ Water color the 'cones' with the Aqua Painters and the Soft Suede ink pad. Technique Thursday: In Water Coloring: Create shadow, leaving areas of lighter, areas of extra layers and shadow. Follow the lines of the stamped image for best results, as well. ~ Apply the ice-cream with the Mini Glue Dots. ~ Accent with this pretty Decorative Label punched saying. With the saying stamped lower in this punch frame with the STUNNING Glitter Pool Party Ribbon bow. Add the bow with the Mini Glue Dots. Deliver a sweet and calorie-free hand-crafted card that is sure to deliver smiles. Created at a recent card making class where we had a blast connecting over creating and card making ~ Join Us! Grab these pretty FREE stamp sets, papers, Project Life collections and stunning glitter tape collections for a limited time - only 6 more days. A pop of sparkle, a sweet card with the prettiest of papers, ribbons and the ease in making this pretty hand-made card. I hope this sweetens your day!